Although life has flourished in the Bribir area since the Early Neolithic (as witnessed by the settlement at the site of Krivače, by the rivulet Bribirčica), it seems that the Bribir hilltop (Bribirska Glavica) itself has been settled only from the Bronze Age, when local inhabitants built there the first fort. 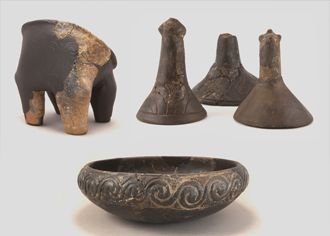 In the Dol area, alongside the eastern walls of Liburnian Varvaria, several Iron Age houses have been excavated, and a multitude of objects from the time have been unearthed. Alongside the road that climbs the southern lower slopes of Glavica up towards Vratnice (place name meaning ‘gateway’), where the main entrance to the prehistoric settlement was, several Iron Age graves have been found. 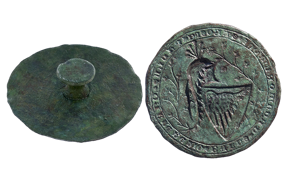 Their grave goods tell of the advanced technological and artistic level of Liburnian Varvaria, as well as of its contacts with other parts of the Mediterranean world, primarily with the Greeks, with the Phoenicians and the peoples of the Italian Peninsula. This explains why the earliest inscription discovered at Bribir (2nd-1st century BCE) is in Greek. 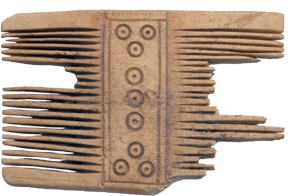 The economic and political power of the Liburnian communities during the Iron Age rested upon their naval supremacy, which often translated into piracy. Understandably, this branch of the Liburnian economy made a great impression on classical writers. Later Roman sources (Pliny) state that the Liburnian territory consisted of fourteen civitates, of which at least some might be assumed as dating from pre-Roman times. Some of them are mentioned in inscriptions (from neighbouring Asseria, as well as Clambeate, Corinium, Nedinium) and it can be supposed that Varvaria was one of the most important ones. Not only was it extensive (fines Varvarinorum stretched inland as far as Promona), but it also controlled the bay into which the Krka River (Titius flumen) debouched, an ideal haven and anchorage. Sources are not clear on the relation between these Liburnian communities. It has been suggested that they were loose alliances that could be activated in moments of major external danger, threats from maritime rivals, for example, or from neighbouring tribes. At any rate, the current state of research indicates that the Liburni never managed to create a unified state. At the waning of the prehistoric period, when they had lost their dominance on the sea, the Liburni were reduced to the coastal area of the northern Adriatic and the north Adriatic islands. Unlike the other communities on the eastern coast of the Adriatic, the Liburni came into contact with the Romans very early on. Their peaceful incorporation into the Roman Republic, in the second half of the 2nd century BCE, was related to the constant threats of neighbours, the Greek colonies in the central Adriatic by sea and the indigenous Dalmatae by land. Their conflict with the latter, who had wrested from them, in 50 BCE, the fort of Promona, to the south of the Krka river, is well known (Appian). In such circumstances, Varvaria became the burg on the frontier with the Dalmatae, with whom the Romans and their allies sporadically fought between 156 and 33 BCE, and even during the Batonian war (6-9 CE). The small and manoeuvrable Liburnian galley was adopted and remodelled by the Romans who turned it into a bireme-type warship, which was integrated in the fleets of the imperial period. The liburna, as it was called, was probably already used by Caesar, but it is first attested in Octavian’s fleets, including the one that brought him the victory in the naval battle of Actium, in 31 BCE, against the navy gathered by Anthony and Cleopatra. Remains from Roman times have been found in almost all parts of Glavica on which excavations have been carried out. As a rule, these are ruins of urban houses and villas, often fitted with big cisterns used for rainwater collection. A fairly large number of rooms in the Dol area were decorated with frescoes and paved with polychrome geometrical mosaics. 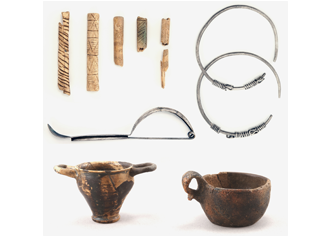 In the excavated strata and everywhere on the surface, valuable specimens of the Roman period material culture have been found, particularly inscribed or decorated architectural elements, glass and pottery vessels, lamps, metal objects (jewellery and parts of clothing, tools as well as everyday use objects), coins, artefacts of bone, antler or ivory. In several residential areas of Glavica, remains of the streets, drains and sewers of the time have been noted, and, in the Dol area, structures have been associated by past excavators with nymphaea. 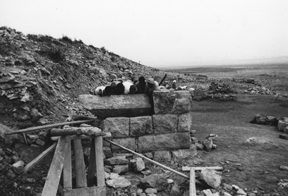 Particularly during the 1960s and 1970s, archaeologists devoted special attention to the ramparts of ancient Varvaria. It has been ascertained that a quite large part of the fortifications was inherited from the prehistoric period and that during the centuries of Roman rule they were only repaired, with the first restorations taking place, as it seems, under Marcus Aurelius. Various inscriptions hint at religious buildings. In the central part of the hilltop, where the cemetery is situated today, the foundations of a Republican period monument have been recently uncovered below the level of a late antique church, suggesting a pre-existent religious edifice. 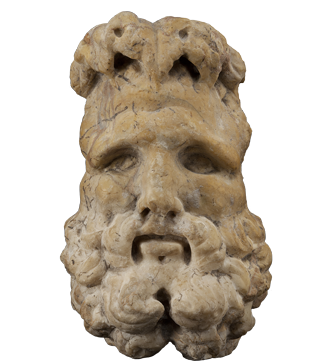 It seems that the domestic Silvanus was the most popular divinity in Roman Varvaria, since quite a few reliefs and altars dedicated to this deity have been found. Various inscriptions and sculptures indicate the veneration of other Roman deities, such as Apollo, Jupiter, Janus, Mars, Liber, Diana and Luna. One altar also records the veneration of Egyptian Isis. Former excavators assumed that the forum of Roman Varvaria lay alongside the southern slope, not far from the fortifications erected during the Ottoman-Venetian wars. As was commonly the case in Roman times, the cemetery of Varvaria was situated outside the urban area, flanking the approach road that climbed up to the main entry into the settlement, along the southern and western lower slopes. 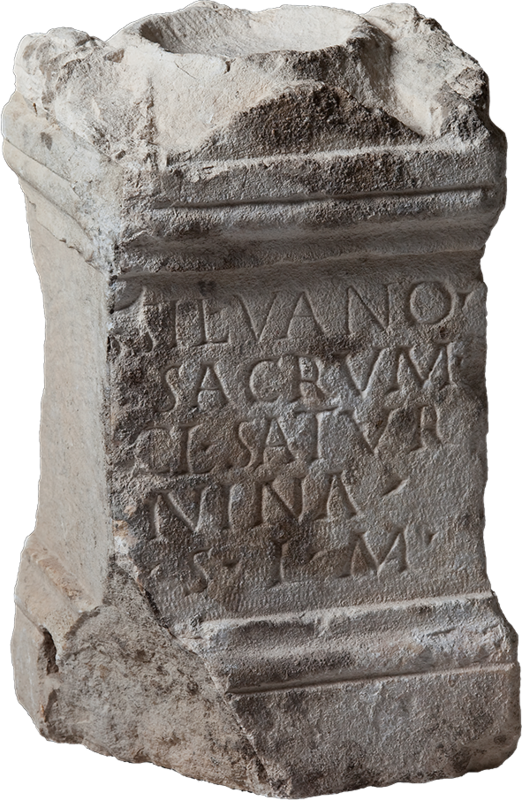 As suggested by a funerary epigraph of T. Allius Saturninus from nearby Burnum, who was a decurion and one of the quattuorviri of Varvaria, the fortified town acquired a municipal constitution in the early imperial period, probably in the mid-1st century CE. Since Italic civic rights were attained early, it is hardly surprising that the municipium had a motley ethnic composition. Numerous inscriptions indicate that visitors, sometimes prominent ones, came from all parts of the Roman world. 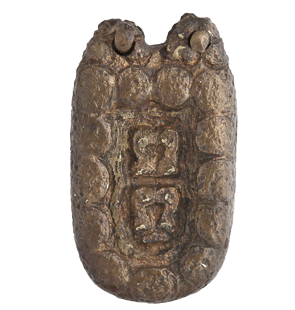 Finds from the period of Late Antiquity are the scantiest to have come from Bribirska Glavica. We have a little more knowledge only about some domestic buildings that might be assigned to this period and about the walls that were repaired and extended likely in the 6th century. Individual, isolated artefacts led some archaeologists assume that somewhere on Glavica there must have been a church, but in the grid of walls excavated until recently, these remains had not been identified. It was formerly assumed that such a building was to be expected somewhere around the present village graveyard, for it is in this place that the possible parts of a rather long-lasting Christian complex have been found. On the northern side of the current church of Sts Joachim and Ann, a late antique mausoleum has been uncovered, with a vaulted funerary chamber, a stomion and a dromos, the latter provided with an a pozzo entry on the western side. Two sarcophagi were placed in it, of a type common in Dalmatia from the 4th to the 6th century. A freestanding stone sculpture representing a dove, missing only the head and the wing tips, was retrieved in the funerary chamber in 1969. Stylistically assignable to the Justinianic period, this object must have once stood as acroterium on the ridge of the gable-roofed funerary chamber, indicating the Christian character of the tomb. The excavations carried out by the Project since 2014 have demonstrated that the rotunda building referred to above, the walls of which abut onto the mausoleum, also belongs to the late antique horizon (previously, it was imagined that it dated to the early medieval period). Among the ruins in the immediate vicinity of this circularly-planned church, the impost of a mullioned window with a carved Latin-type cross on each side and a fragment of a lintel with a christogram in relief have been found. The systematic excavation of the rotunda and the ancillary structures connected to it has substantially supplemented our knowledge of the whole complex, for both this church and the mausoleum stood at the corner of a large late antique villa urbana, the walls of which have been dug up in the 1960s on the northern side of the wall of today’s cemetery. Also, belonging to the early Christian heritage of Bribir is the bottom of a glass vessel featuring a staurogram. 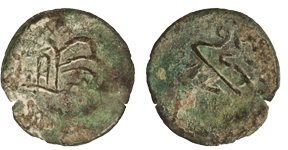 Among the utilitarian finds datable to Late Antiquity, it is worth mentioning two solidi minted under Justin I (518-527) and Justinian I (527-565). A ‘Gothic’ metal S-shaped pendant is the only find that tells of the tempestuous period of the Great Migrations on Glavica. Sometimes during the reign of Heraclius (610-641), the Byzantine administration evacuated the province of Dalmatia, apart from the major cities on the coast. The fate of Varvaria during the Dalmatian ‘Dark Ages’ is obscure, as the material evidence is both scanty and ambiguous. 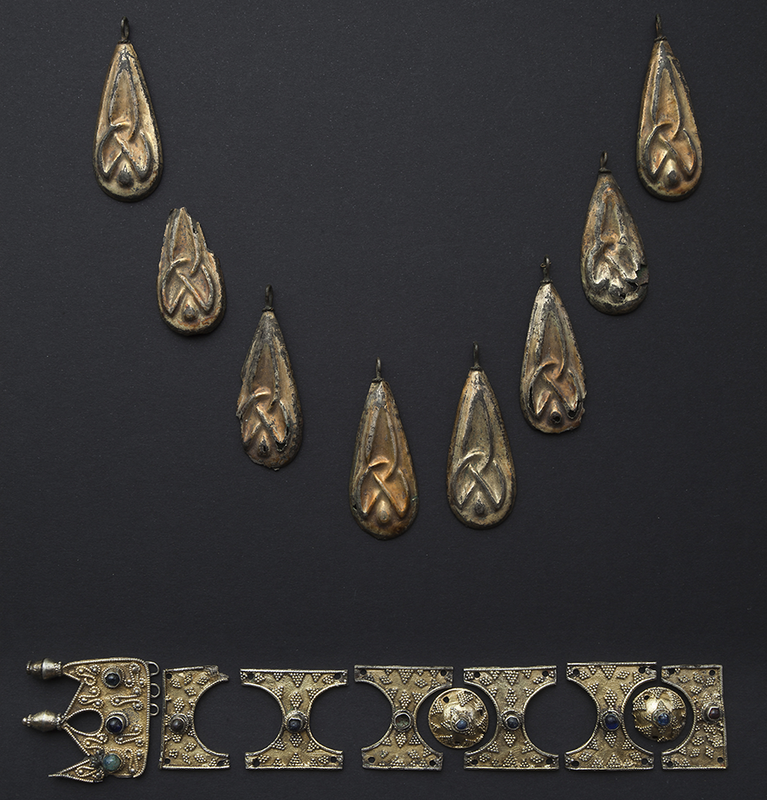 It rests on scattered finds such as a Byzantine gilt bronze belt strap end of the second half of the 8th century, a silver coin of Charlemagne, a Byzantine gold coin minted under Constantine V Copronymus (741-775) and an iron cruciform mounting from a horse’s harness of Carolingian period. Some scholars postulate its destruction by the invading Sclavenes, while others assume that the settlement continued to exist as a military post connected with Byzantine Zadar. What we can say for certain is that on the ruins of ancient Varvaria a new, early mediaeval fortified burg, a castrum, began to develop. Because of its importance in the past, it outgrew its moment and gave its name to one of the eleven early mediaeval Old Croatian territorial and administrative units, or županija (‘county’), Βρεβέρη, whence today’s Bribir. The inhabitants of early medieval Breberium buried their dead in two different row-grave cemeteries outside of the city-walls – one next to the main entrance into the city (Vratnice) and the other one below the south-eastern walls (Novi put). A certain number of graves in these two cemeteries contained grave-goods and can be dated to the 9th century. Contemporary to these, was another cemetery (Groblje), created around the rotunda church, that became, in the later part of the 9th century, the main funerary area of the settlement. The recent excavations of the Project ascertained that the rotunda church was spared the destruction of the end of the late antique period, if such event took place. Indicative in this regard are the state of preservation of its walls and the remains of stone liturgical furnishing with which it was reequipped in the 9th century, probably during the rule of duke Branimir (879-892). Fragments of early Romanesque reliefs associated with this church hint at repair and furnishing works carried out in the first centuries of the Middle Ages. However, these fragmentary objects alone do not allow for any more general conclusions to be drawn. 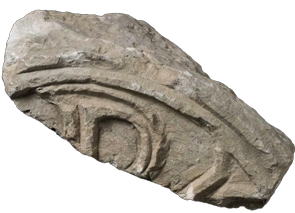 Only one stone fragment datable to the 9th century, a part of a relief cross with three-stranded interlacing and the remains of an inscription, together with several fragments of architraves decorated with hooks, can be compared with similar anepigraphic items that were unearthed in the immediate vicinity of Bribir. Other fragments of lapidary material, one ornamented with two-stranded plant tendrils and another one featuring two dogs heraldically placed on both sides of a tree, which recalls similar 11th century reliefs from Zadar, are interesting from a visual point of view. All in all, for the moment, we know too little of the secular, and particularly of the Christian, buildings at Bribir, the county centre to the 12th century. This knowledge is out of proportion with the situation known to us from the immediate surroundings, where comparable remains have been unearthed in Krković, Lepuri, Ostrovica, Otres, Žažvić and Ždrapanj, for example, mainly at sites that are – like Bribir – clearly correlated with earlier ancient buildings and early Christian cult structures. The early mediaeval dedicatee of the Bribir rotunda church is not known, unless its remains conceal the important abbey church of St John the Evangelist, in which the Bribir archpresbyter had his seat (first mentioned by written records in 1229). It is known that the patronage of this abbatial church was in the hands of the clan of Šubići de Breberio, mediaeval lords of Bribir (St John was one of their patron saints) who were influential in the selection of priests who looked after it, and since in the 14th and 15th century it was the seat of the Bribir parish, it was often endowed with valuable chattels and real properties. Hence in this period it is several times mentioned in historical documents. In the 12th and 13th centuries, Bribir was an important and well organised social and political centre of Croatia. Here, was the seat of the Šubići de Breberio (nobiles / comites / principes Breberienses), who, during these centuries, became the most distinguished and powerful Croatian nobles. It seems that one of their forebears, župan Budec, was the chamberlain of the Croatian king Petar Krešimir IV (1066-1070), but it is certain that their rise to power started in the beginning of the 12th century, mainly thanks to their good relations with the kings of Hungary, who became the overlords of Croatia in 1102. The original name of the family might have been Bribirščić (Berberistich, Berberestiti, Broborstici), derived from the name of their seat, Bribir. In time, the Šubići became extremely influential, especially after the Hungarian king Bela IV confirmed, in 1251, the possession of the Bribir county as hereditary to Stjepko, the father of Paul I de Breberio (Pavao I Bribirski). After Paul I de Breberio (d. 1312) received from the king the hereditary honours of viceroy (ban) of Dalmatia (banus maritimus), in 1273, and then the title of ‘lord of Bosnia’, in 1302, the Šubići became the most powerful local feudal magnates, while Paul I himself was, prior to his death, the sovereign and independent ruler of Dalmatia, Slavonia, Chelm (Herzegovina) and Bosnia. At Bribir, he had a chancellery that issued and authenticated various kinds of documents. 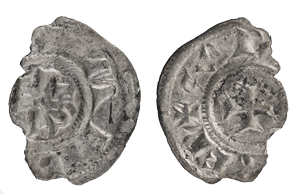 He minted his own coins and, according to the reputation and political power he had acquired, it was said that he was the uncrowned king of the Croats, particularly after the death of his overlord, the Hungarian king Ladislaus IV Cuman, in 1290. 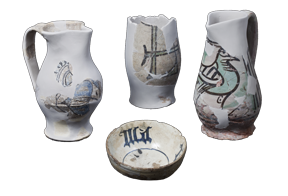 The archaeological research directed by S. Gunjača up to the 1980s and afterwards by other archaeologists of the museums of Šibenik and Split has revealed the extremely rich high and late medieval heritage on Glavica. But the grid of the mediaeval burg has not been ascertained, except for clusters of buildings or individual structures scattered over the whole site, the most notable of which being the monastic complex with the church of St Mary in its centre, in the Dol area. Dedicated in 1300, this church was the foundation of Paul I, who was himself buried therein. In and around it, developed a late medieval cemetery, which was probably reserved for the Šubići clan and the Franciscan monks of the monastery. Dating from this period, another small Gothic church was discovered not far from the rotunda, adjacent to the modern graveyard, where another small cemetery developed. To a slightly earlier period (perhaps the 12th or the 13th century) dates the Romanesque church which overlooked the cemetery at Vratnice. The written sources mention in mediaeval Breberium the churches of St Mary, St John, St Saviour, St Stephen, St Mark and St Andrew, of which only St Mary has been identified with certainty. Also, the residential complex of the Šubići has not been precisely and reliably determined. 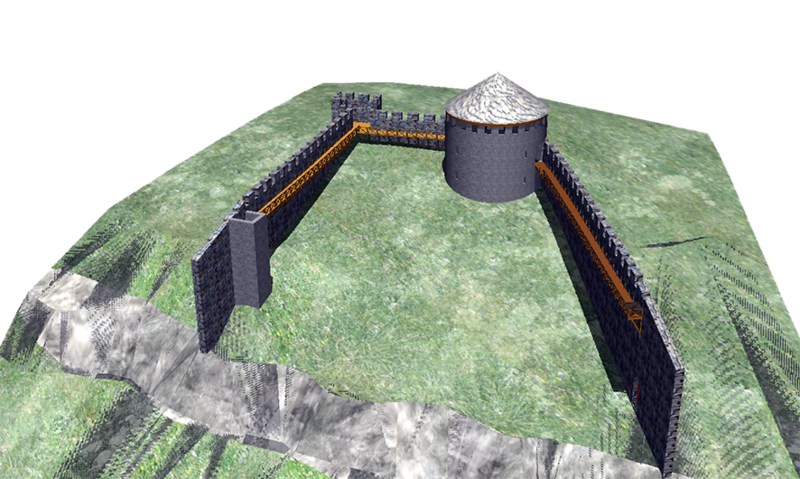 Earlier excavations have shown that the fortifications of the burg were not fundamentally different from the late antique and early mediaeval ones. 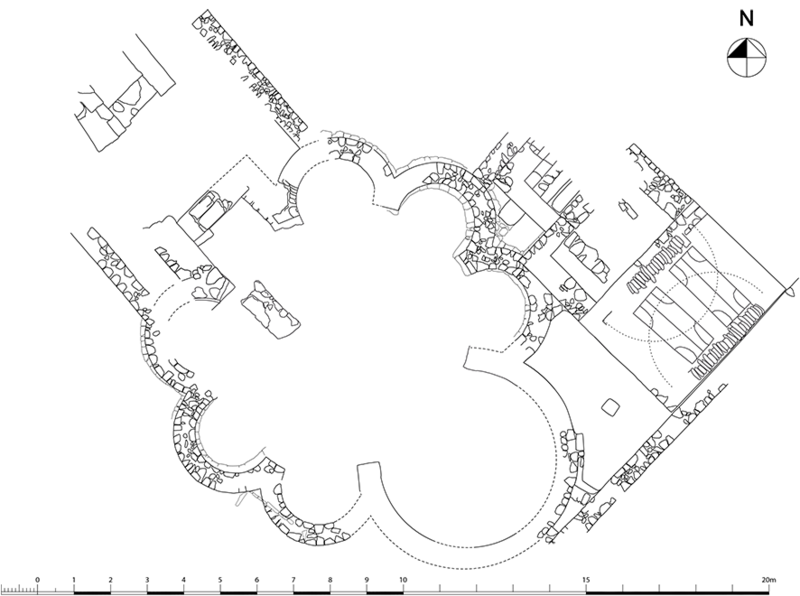 The main novelties in the defensive system are two smaller forts: one that features a square ground plan, in the Dol area, and another one, dating to the Ottoman period, which was erected in the southern perimeter of the burg and is composed of a round tower and a spacious fortification of trapezoid ground plan. The overall image of a developed feudal town is backed up by a rich archaeological inventory including ceramic and glass vessels imported from Italy and Spain or the grand sculpture that graced the monastery and the Gothic church of St Mary. Breberium maintains this status even after the political downfall of Paul’s son, Mladen II, in 1322, right until the Turkish inroads in the first decades of the 16th century. Breberium came under the Ottoman power probably at the same time as the neighbouring Ostrovica fort, in December 1523. The settlement was part of the sanjak of Klis and locally belonged to the nahiye of Ostrovica and the jurisdiction of the judge (kadi) in Skradin. There is very little information about this period. From the census (defter) of the Klis sanjak, we know that the church of St John was looked after by three priests who escaped to the Venetian territory between 1540 and 1550 and that after that time the church was under the jurisdiction of the Franciscans from the Visovac convent. The defter of 1604 indicates that a village fair (penayir) was organised at Bribir near the church of Sts Joachim and Ann, which constitutes the first reliable mention of this church. Until 1604, no Ottoman soldiers were recorded at the site, but the existence of the tower from the Ottoman period implies that a small garrison might have been placed there in the 17th century. The settlement declines in importance and the material record is very modest; for example, only four Ottoman coins (akçe) were discovered on the site. The burials in the cemetery around the church of St Mary continued for some time, at least until the late 16th century. The Ottoman period comes to an end when the settlement is taken by the Venetian Republic, during the Morean war (1684-1699).